In addition to the new work completed, Breslin Builders provide renovation services to aging structural and mechanical items, upgrading beams, replacing drain lines, and other items effected by years of services. Larger and more photos of this project can be found in an album on our Flickr site. 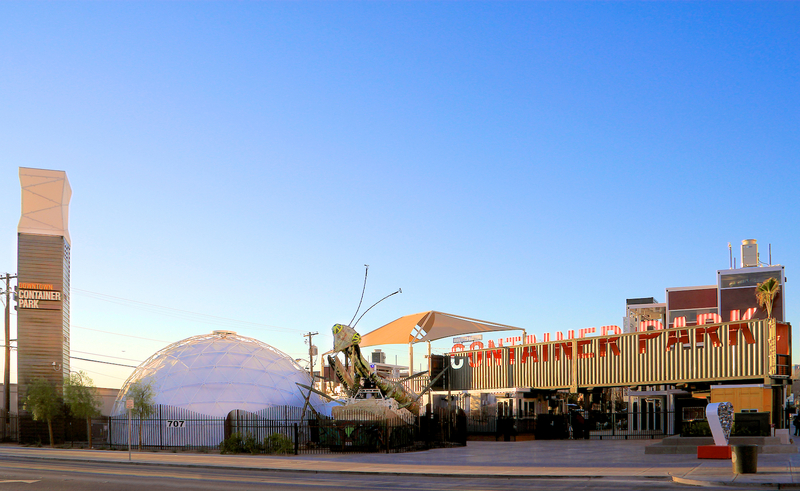 Breslin Builders provided design and construction services for the new Downtown Container Park at 7th and Fremont in downtown Las Vegas. Almost two years in the making, this project was the inspiration of Tony Hsieh to help rejuvenate part of the downtown area and provide a much needed place for retail, food and beverage, and entertainment along East Fremont. Breslin Builders has been involved from the beginning of the project, including the initial assessments of the old Orbit Inn property, which we eventually demolished for Downtown Project in preparation for this world class project. Utilizing a combination of 39 repurposed shipping containers and locally manufactured Xtreme Cubes, the project has a unique setting in this half city block along 7th Street between Fremont Street and Carson Avenue. The mixture of containers, X Cubes, Trex decking, pavers, railroad cars, a 44 foot diameter immersion dome, as well as the custom made Cre8Play tree house, make the Downtown Container Park like no other in the world. In fact, the project boosts from firsts including the use of a 40 foot shipping container for an elevator shaft and the first commercial play area (the Interactive Exhibit Zone) to use shipping containers as part of the play structures. Designed with a mixture of retail spaces (mostly located in the Xtreme Cubes), five food and beverage locations (located within the shipping container product), a barber shop (in the train uses), and support facilities for the property, the project has a little something for everyone. 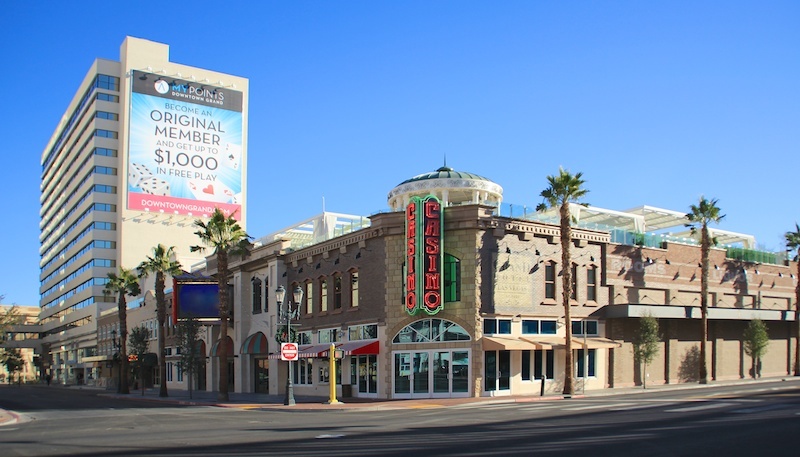 When in downtown Las Vegas be sure to stop by and check it out. More information can be found on the project’s website – http://downtowncontainerpark.com. 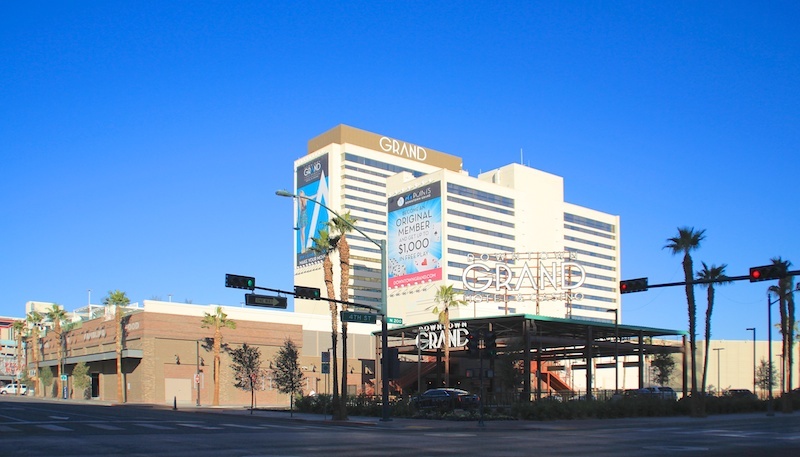 Breslin Builders completed the work on the long awaited Downtown Grand (formerly the Lady Luck Hotel and Casino), located on Third Street at Ogden in downtown Las Vegas. The work completed by Breslin Builders provided a complete make over the facility including the casino area, new restaurants and associated kitchen, new roof top pool area, and complete renovations and upgrades to the hotel rooms in both existing towers. Additionally, the exterior facility has a new exterior facade matching the “industrial warehouse” feel (keeping with the interior theme where the massive steel trusses were exposed (as well as some of the old “eye in the sky” cat walks)), as well as new site work and parking lot on the east side of the property. Breslin Builders has been working in this area for many years, including doing some remodel work back in the day when the Lady Luck was still open. We also have provided construction services across the way on 3rd Street including the facade remodel of the old Trolley Stop into the current set up of the Sidebar, Triple George Grill, Celebrity (which is now Pizza Rock), and Hogs and Heifers. We are pleased to final complete the Downtown Grand and be part of this unique experience along 3rd Street. Breslin Builders completed two projects to date for the PDQ Restaurant chain, which has fresh chicken tenders, salads, and sandwiches. Locations include their first in the Las Vegas valley on West Craig Road and their second one on West Sahara just west of the I-15. Both sites are ground up buildings complete with full site work, a drive-thru lane, and full building construction. A photo album of the West Sahara location (which matches the Craig location) can be found on our Flickr page. What was once a Tony Roma’s restaurant has become a new Lo-Lo’s Chicken & Waffles restaurant at 2040 N. Rainbow Boulevard, in the northwest part of the Las Vegas valley. The restaurant, is being converted to a new Lo-Lo’s Chicken & Waffles, the first franchise location in Las Vegas. 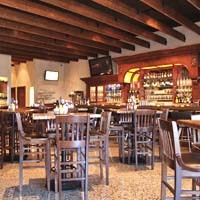 Breslin Builders provided design-build services for this new restaurant remodel and addition. Part of the existing interior dining room was removed to create a new exterior patio space. The kitchen area was completely remodeled and updated to their new equipment requirements, along with new fresh finishes. The island bar was updated and has a new canopy installed. New finishes, paint, and lighting was provided throughout also. Blog photos and info can be found by clicking here. Breslin Builders completed the new Toros Tapas Kitchen and Gaming Restaurant at 11760 West Charleston. The project started out as a different half-built restaurant space that the current owner, Adam Corrigan, took over and redesigned to fit the current needs. 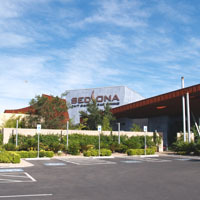 Working closely with the owner, Breslin Builders provided design-build services for the project including everything from assessment and measured drawings of the existing conditions within the shell space, to design services, working with the City of Las Vegas Building & Safety for building permit procurement, to construction and finalization of the space for occupancy. The new space includes a bar with gaming machines, new kitchen, new dining areas, and restrooms, all with a touch of a spanish feel, including wood flooring, wood wall coverings, metal ceilings with wood beams, and terra cotta tile in the restrooms. Check out the space on their website – http://toroslv.com. This space is across the plaza from work we completed for the same owner in years past at the John Cutter Restaurant and Bar. Breslin Builders coordinated with Paul Deusing Partners to create this unique restaurant located on the main floor of the Hughes Plaza West office project, also completed by Breslin Builders. Having to work with strict building codes and existing two-story building constraints, Breslin Builders was able to accomplish the vision of both Michael Corrigan and Paul Deusing, creating a unique restaurant like no other. Breslin Builders constructed the original project and has since completed the remodel of the interior space to provide a new and upscale look. 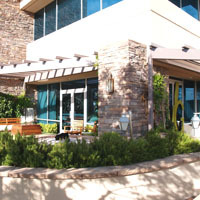 Located in The District at Green Valley Ranch, Kennedy and Al’s Garage are two very different restaurants sharing one build-out space and kitchen. Breslin Builders was the general contractor on both contrasting spaces. 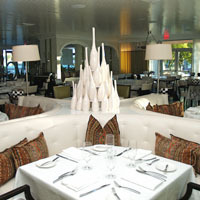 Kennedy is a 24/7 gaming, bar, and dining establishment providing modern American cuisine in a plush intimate setting. 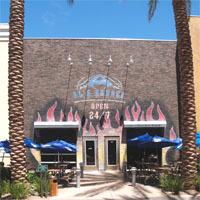 Al’s Garage, on the other hand, provides the more edgy garage side of the experience including burgers, bar and gaming. This project provides something for everyone. “From custom upholstered seating to the spray painted menu on the wall, you will know this is no ordinary pit stop”. Breslin Builders provided construction services for this upscale restaurant and bar with a South Sea flair. 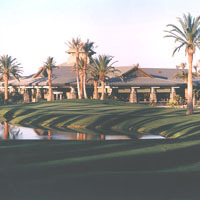 Overlooking the nationally recognized Bali Hai Golf Course, which Breslin Builders also provided construction services, this location provides the diner a unique and exotically themed gourmet experience. Both indoor and outdoor patio dining areas are offered overlooking a blue lagoon setting. 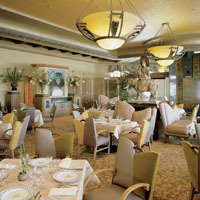 The restaurant shares space as part of the 32,000 square foot Bali Hai Golf Course Club House. In addition to the restaurant, a golf pro shop, offices, and other golf course support facilities are located in the same Balinese themed structure. Working with the Golden Gaming Inc., Breslin Builders provided design and construction services for their premiere Sierra Gold location at Stephanie and Warm Springs at the Adobe Plaza complex in Henderson, Nevada. 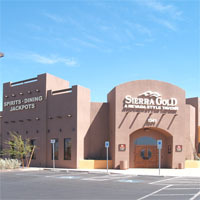 The Sierra Gold product is Golden Gaming’s upscale tavern type with high-end wood trims and finishes creating a unique environment for their patrons. According to Golden Gaming, Sierra Gold provides “an intriguing mix of contemporary design and luxury. Sierra Gold combines the sultry atmosphere of an ultra lounge with the casual comfort of a neighborhood tavern”. 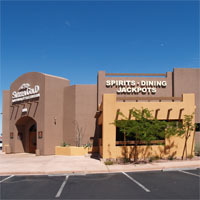 Breslin Builders provided full in-house design and construction services for this unique restaurant/tavern establishment located on West Charleston Boulevard just before you enter the Red Rock Canyon area; adding yet another iconic location to Suburban Restaurant & Gaming Group’s portfolio of restaurants completed by Breslin Builders (other include Sedona, Kennedy, Al’s Garage, and RoadRunner Saloons). With less than 2,000 square feet to work with, Breslin Builders Design Group’s careful planning allowed for a full service kitchen, bar with 15 gaming machines, and a 62-seat dining area with a mixture of high-top seats and booths. This allowed for some unique uses of materials for the interior design and space planning including the inclusion of glu-lam beams not only as a decorative ceiling feature, but also were incorporated into an attractive window blind louver system and the table tops. 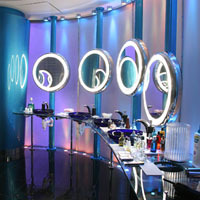 The flooring includes diamond polished concrete with embedded colored stone and glass. Diamond plastering, real stone veneering, and mahogany wainscoting cover the dining and restroom walls; and an old style mahogany bar round out the finishes making this a one-of-a-kind restaurant. 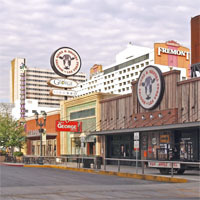 Breslin Builders was instrumental in the transformation of Third Street between Ogden and Stewart on the west side of the original Lady Luck Hotel Casino. Providing facade and shell design and construction services, Breslin Builders helped transform Third Street into a viable downtown entertainment destination. Consisting of various entertainment uses, Breslin Builders transformed the existing Trolley Stop building into multiple uses and designed a multi-use facade for the existing building. Tenants in the new project include Celebrity (a multi-use stage entertainment venue), Sidebar (a sophisticated place to relax with a cocktail) Triple George Grill (an upscale restaurant and bar use), and Hogs & Heifers Saloon (a famous and legendary favorite bar hang out). The street was also redesigned for valet and one-way traffic. Breslin Builders also provided shell design services for Celebrity, design and documentation services for Sidebar, and full design services for the facade and interiors for Triple George Grill. Located on Third Street, this upscale restaurant serving “Bay style seafood and dry-aged steaks” was designed and constructed by Breslin Builders. 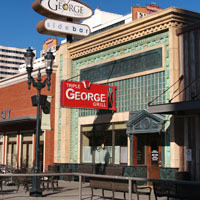 Using timeless materials like stained mahogany wood paneling and millwork, wood planked flooring, brick veneering, stained glass, and mosaic tiling, Triple George Grill provides a unique experience for the downtown visit and resident alike. Whether choosing to sit at the center bar, the long counter, in a booth, or in the lounge area, Triple George Grill will provide that “memorable meal with friends you wish to impress”. Breslin Builders has been the choice of Timbers Hospitality Group since they started establishing their brand in the Las Vegas Valley area. 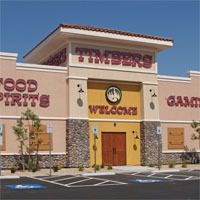 With over eleven locations completed to date, and many more on the way, Timbers has become a favorite spot for Las Vegas locals and visitors alike. Designed with a lodge feel and using exposed woods, stained concrete floors, and stone covered walls, Timbers are designed to return you to the yester years of log cabins and mountain and mining retreats, while providing a full kitchen and bar setting. Project services provided range from full design of free standing projects to tenant improvement build-out in existing shell spaces. 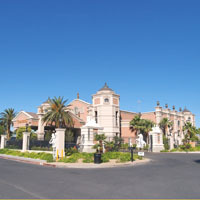 This upscale nightclub was designed to fit within the requirements of the Clark County Zoning Codes on a small parcel across from the Orleans Hotel Casino on Arville Avenue in Las Vegas, Nevada. Breslin Builders took on the challenge by creating a multi-story cast-in-place concrete parking structure with about 10,000 square feet of ground floor space for the club area. 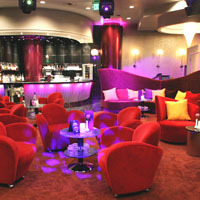 The club is designed with modern finishes and includes a center bar area, unique restroom area, VIP rooms, and support facilities creating a truly unique experience for a 24-hour city like Las Vegas. 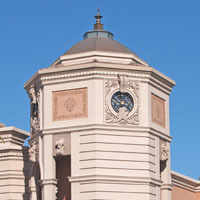 The Westward Ho Casino Expansion provided a unique design and construction opportunity for Breslin Builders. Combining a full casino use and associated support uses with a convenience store with fuel pumps, a bar with an entertainment stage area, and a deli and full service kitchen, this project allowed Breslin Builders to combine its previous project experience on different projects to create this one-of-a-kind establishment. Designed to complement the with old west theme of the Westward Ho name, this single building was designed to take on the appearance of an old west street with multiple facades and uses. Treasures Gentlemen’s Club set a new benchmark for gentlemen’s entertainment in Las Vegas with the completion of this 26,000 square foot plus two-story club. Combined uses including lounge areas, entertainment stages, VIP Room, various bars, as well as a full service kitchen supporting a Steakhouse, Treasures “provides an atmosphere of casual elegance combined with the ultimate club experience”. Breslin Builders provided both design and construction services provided on this project. 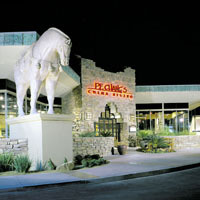 P. F. Chang’s provides an experience that is “a unique combination of Chinese cuisine, attentive service, wine, and tempting desserts all served in a stylish, high-energy bistro”. Owner: P. F. Changs China Bistro Inc.
Breslin Builders has been the general contractor on various Roadrunner locations in the Las Vegas valley area providing a unique blend of indoor and outdoor dining and lounging experiences. 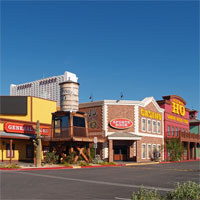 RoadRunner offers “authentic American cuisine with a fun and authentic western theme”.